Rwanda is Africa’s most densely populated country. Approximately 80% of the labor force works in agriculture. Rwanda has made substantial progress in stabilizing and rehabilitating its economy to levels seen before the 1994 genocide. Nonetheless, about 44% of the country lives below the poverty line. CRS works to strengthen vulnerable households with programming that includes agriculture and food security, health and nutrition, economic strengthening and peacebuilding. The Catholic Church is one of the longest standing institutions in Rwanda's modern history. The reach of the Church and its involvement in socio-economic and peacebuilding activities is substantial. 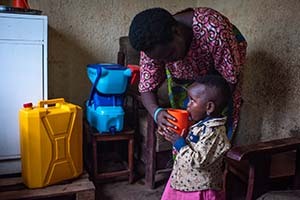 In Rwanda, CRS is educating families on healthy diets, while encouraging people to save money and invest in better sanitation, like latrines and hand-washing stations. Learn more about the impact this is having. We’re helping people learn how to grow their own food and cook nutritious meals, so they are more self-reliant, and live healthier lives. See how we’re doing this. With access to clean water and sanitation, children are healthier and have a greater chance of thriving. Learn about this impact. A CRS program designed for vulnerable mothers and children also helps fathers take responsibility for family health. For this mother, CRS project means no longer watching her children suffer from hunger. Businesswomen in Burundi, the DRC and Rwanda are making conflict resolution their stock in trade. Catholic Relief Services began operations in Rwanda before 1960, providing humanitarian assistance from neighboring countries until it established an office in 1963. From the 1960s until the late 1980s, CRS implemented a large-scale nationwide school-feeding program. In the 1980s, CRS increased its focus on small enterprise development and agricultural production. During the early 1990s, CRS managed U.S. government-provided food assistance and other aid to respond to the needs of a population suffering increasingly from unrest and fighting. In June 1994, CRS began an immediate response to the short-term emergency needs of the ravaged country, torn by war and genocide, and continued this emergency support through 1997. CRS also initiated several agricultural rehabilitation programs to give returnees and the internally displaced the necessary seeds and tools to re-launch agricultural activities, the chief livelihood of rural Rwandans. Between 1997 and 2001, CRS programs shifted from emergency aid to transition programming. This included the construction of houses for the displaced and institutional feeding to Safety Net centers caring for orphaned children, street children, the elderly and the handicapped. From the turn of the millennium through 2005, the CRS program moved out of transition activities into more focused livelihood interventions and greater engagement with its Caritas partners. 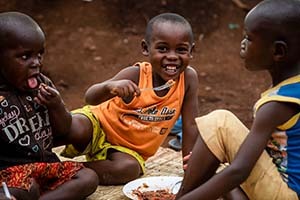 With the launching of The President's Emergency Program for AIDS Relief (PEPFAR), CRS dramatically increased HIV and AIDS activities in 2004 by supporting antiretroviral therapy services to rural health centers, building community capacity to care for orphans and vulnerable children, and promoting abstinence and Be Faithful interventions in schools and communities. At present, CRS works with the Catholic Church and other partners through an integrated approach combining agriculture, nutrition and economic strengthening to help vulnerable people improve the quality of their lives. Peacebuilding programming in Rwanda has focused on community reconciliation that involves promoting trauma healing, peace and justice values, and conflict management and transformation in the community to address the consequences of the 1994 genocide. Today, CRS’ programming supports integrated peacebuilding advocacy and economic strengthening activities with cross-border women traders from Rwanda, Burundi and eastern DR Congo.